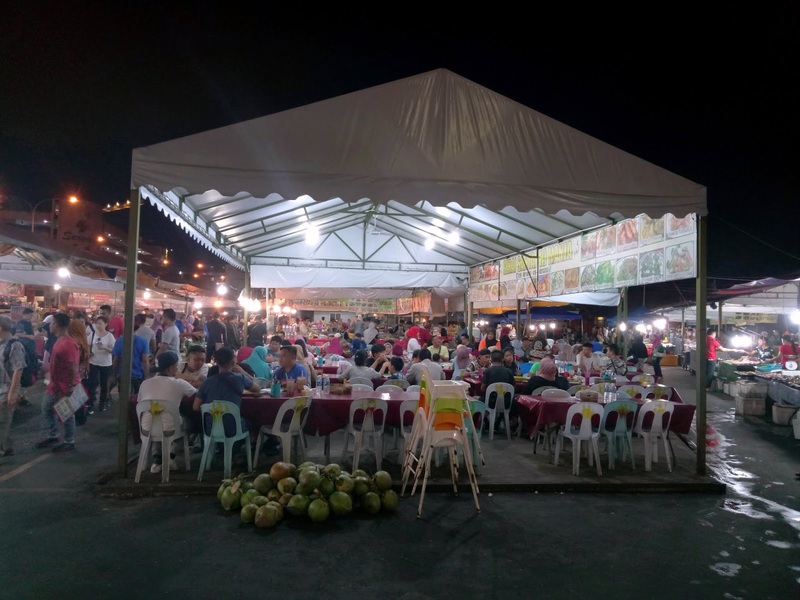 Todak Waterfront is a popular eatery next to Pasar Besar Kota Kinabalu. Open in the evening, the open-air place is known for serving seafood at very affordable prices. There are more than 10 stalls operating here. 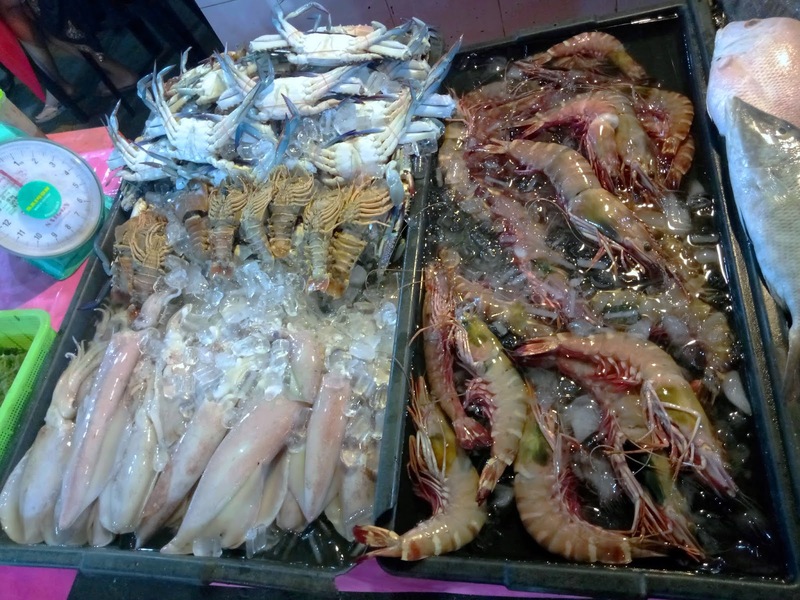 Raw seafood is displayed on ice in front of each stall. The price quoted is inclusive of cooking. It is common to see stall operators haggling with prospect customers. Most of them speak basic Mandarin since a significant number of visitors come from China. After much consideration, we settled for stall # 4 called "Gerai Ummi & Family". This turns out to be a good choice. This stall has a wider variety of seafood including fishes of various colors. Meanwhile, crustaceans include blue crabs, spiny lobsters, slipper lobsters, tiger prawns, white prawns and much more. 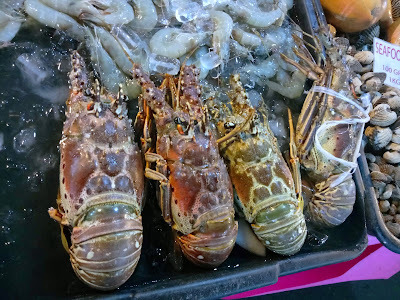 Not only are these delicacies larger than usual, they are extremely fresh too! As for mollusks, we are intrigued by cockles and clams of various sizes. The most prominent one is a sea snail called "melo melo". It is larger than one's fist! Melo melo is sometimes called "bailer shell" because it can be used to bail water out of boats. 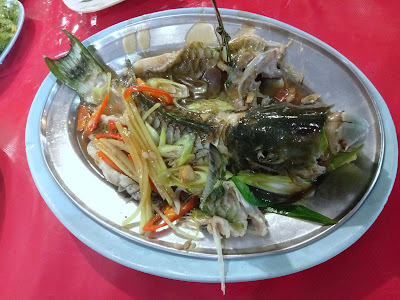 Our first dish is parrotfish (RM20.00), also known locally as "ikan bayan". 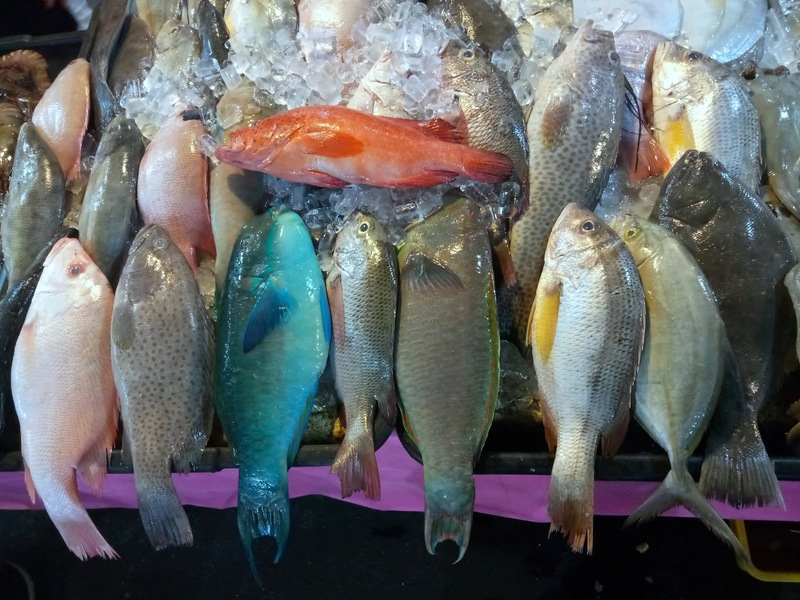 The fish is originally blue in color; the color fades away as the fish is cooked. Parrotfish is named after its parrot-like beak, which it uses to scrape algae off corals. In order to appreciate its delicate texture, we requested for the fish to be steamed with ginger and scallions. Our spiny lobster (RM112.00) is cut into halves and cooked in two different styles. One half is baked with creamy sauce, while the other half is cooked with ginger and scallions. In both cases, the lobster's meat is succulent beyond words. It is worth the hassle of prodding every morsel from the shell! Melo melo (RM17.00) is cut into thin slices and then stir-fried with capsicum and chili peppers. Unfortunately, its rubbery texture does not really appeal to my palate. 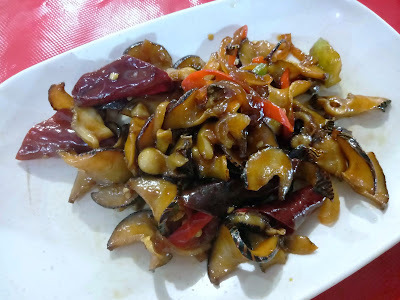 Nevertheless, I am glad that we have the opportunity to savor this delicacy. Latok and agar-agar (RM8.00) are two types of seaweed algae. 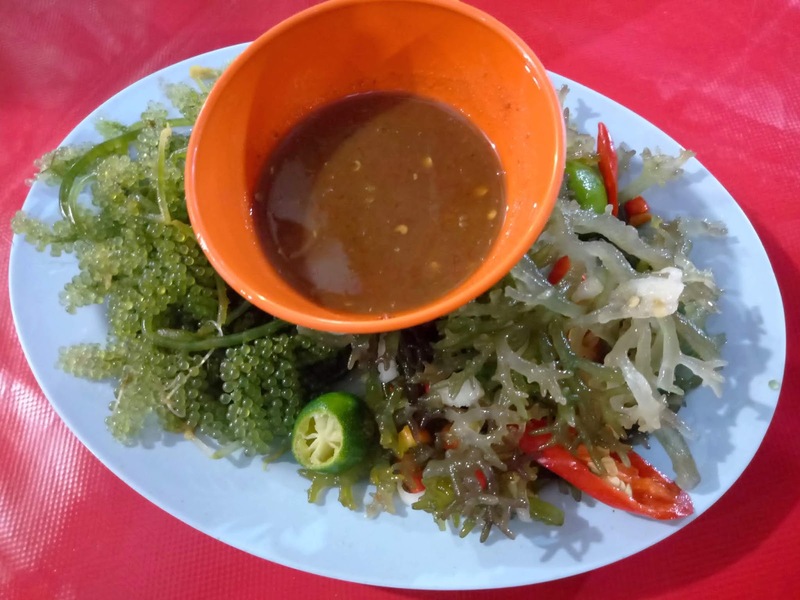 Latok, nicknamed "sea grapes" for obvious reasons, is a popular food among Bajau people. Meanwhile, agar-agar (eucheuma) is often raised in seaweed farms along the coast. 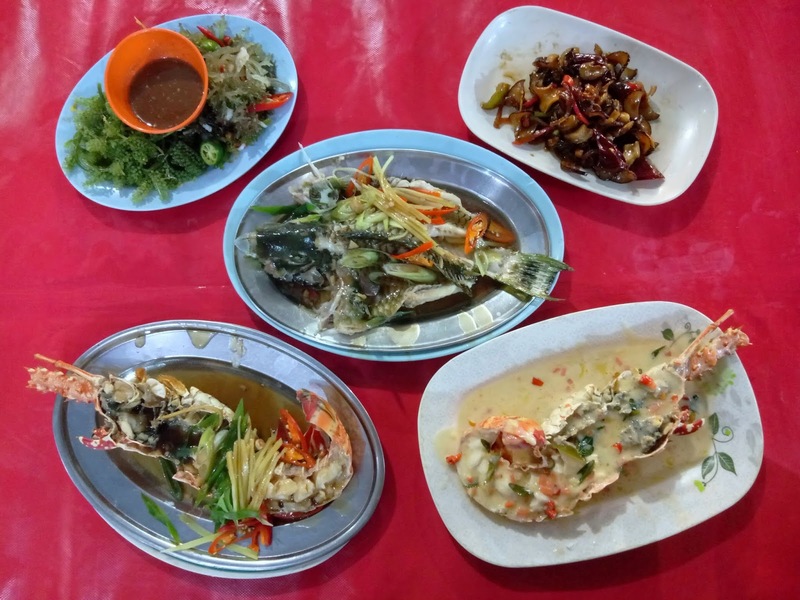 The seaweeds are cooked by blanching in boiling water. 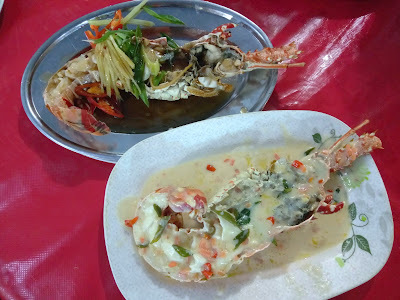 They are eaten with an extremely spicy sauce prepared from chili peppers and lime. 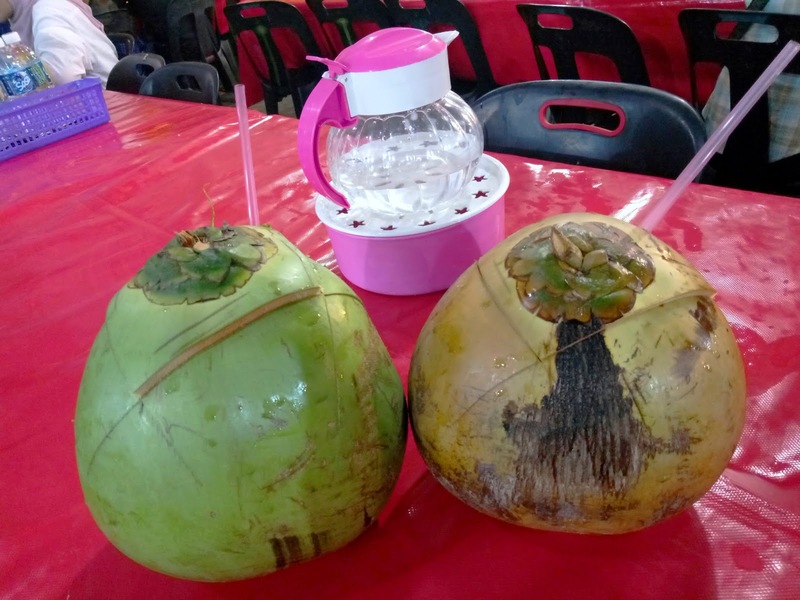 Coconut (RM5.00 each) is an excellent remedy to quench thirst. Young ones are preferred as the pulp is softer. By the way, the jug of water on the table is not for drinking; it is meant for customers to wash their hands. 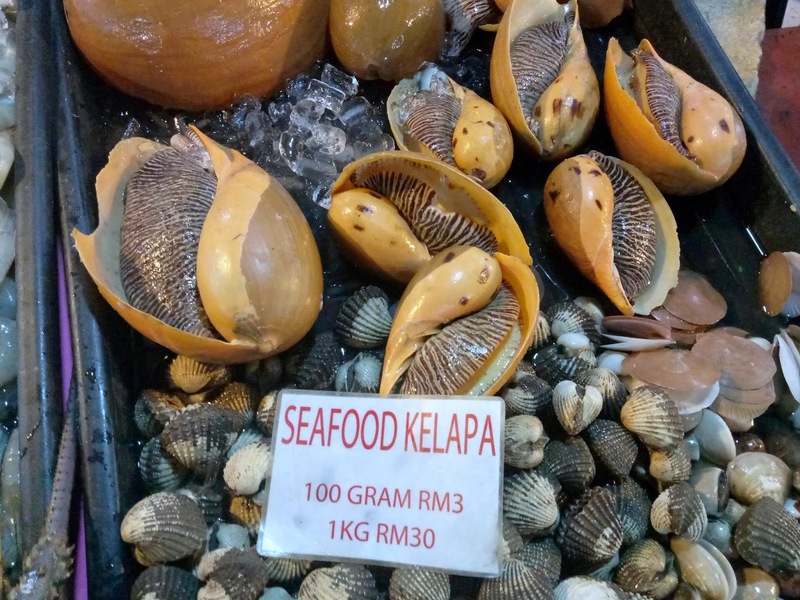 The seafood here is unbelievably cheap by West Malaysian standards. This satisfying meal only costs us RM167.00 including rice and drinks! 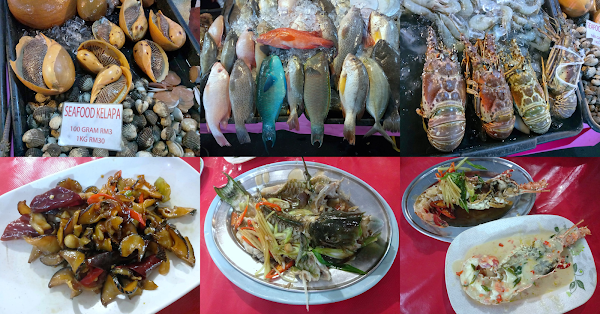 Besides having fresh seafood, the chef's culinary skill is commendable too. He knows the right amount of seasoning to accentuate the natural flavors of seafood.